ok being the first person to review this i feel like i should praise this gun and yet let you know EXACTLY what your getting so lets dig right in. i bought this as a replacement to my Valken Alloy series Mk3, which was too long. so lets hit the pros and cons section and see what G&G brought to the table! 2: MOSFET AND ETU!?! yep thats correct! this gun has these awesome features and it absolutely rips on 3 rd burst. terrifyingly so. 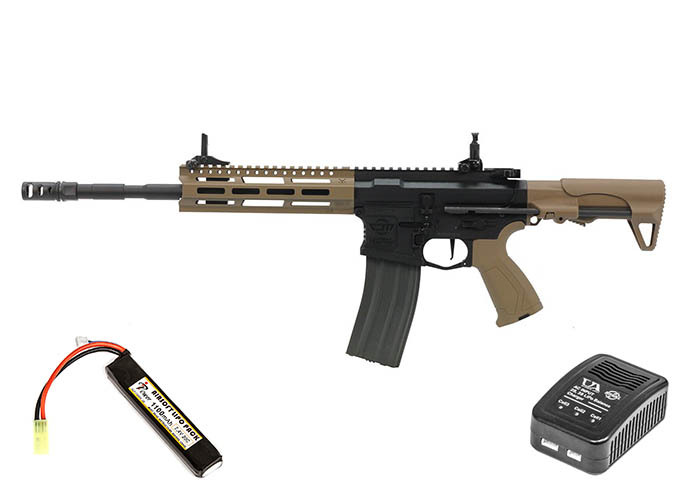 4:whats included: FULL METAL lipo charger with G&G branding and a G&G 11.1v lipo. this gun can handle it extremely well. and a really well made G&G Metal hi-cap magazine. 5:trigger response- you can absolutely spam bb's at your opponents on semi-auto with this. that not enough? switch to full auto to unleash a storm of 18RPS+ at your opponents! this is not a gun to be taken lightly for its price! the stock: now i love this stock i really do. but it can be a bit wobbly. it may just be mine but its not a deal breaker here for what your getting. the rail: its a FULL POLYMER rail. unlike the arp9 which i am pretty sure had a metal one. 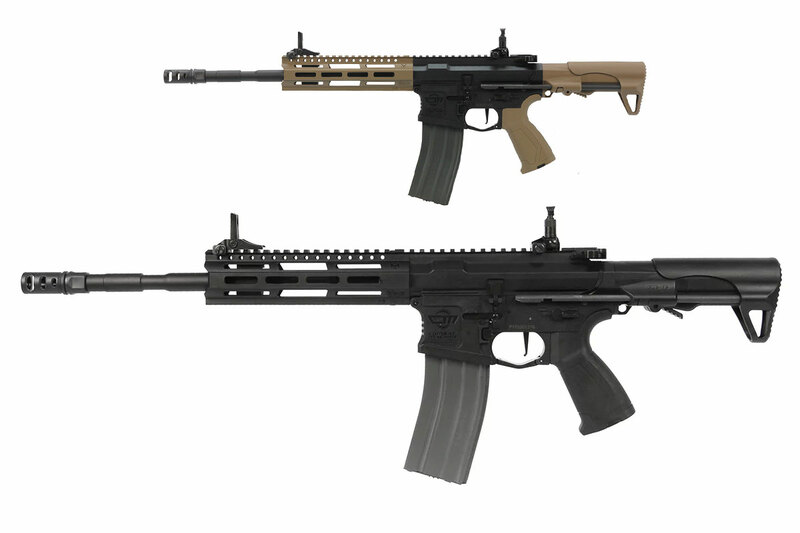 same price range, same etu/mosfet, so why not the same metal Mlok? Recently bought this gun in tan. I would have purchased the package with the battery, but it was sold out at the time. Anyways, I have since bought an 11.1v Lipo & smart charger for it. Took it out to test it the other day and am very pleased. This thing rips! Can't wait to get to my local field to give it a real test. Bought it as my first AEG, and am very pleased. 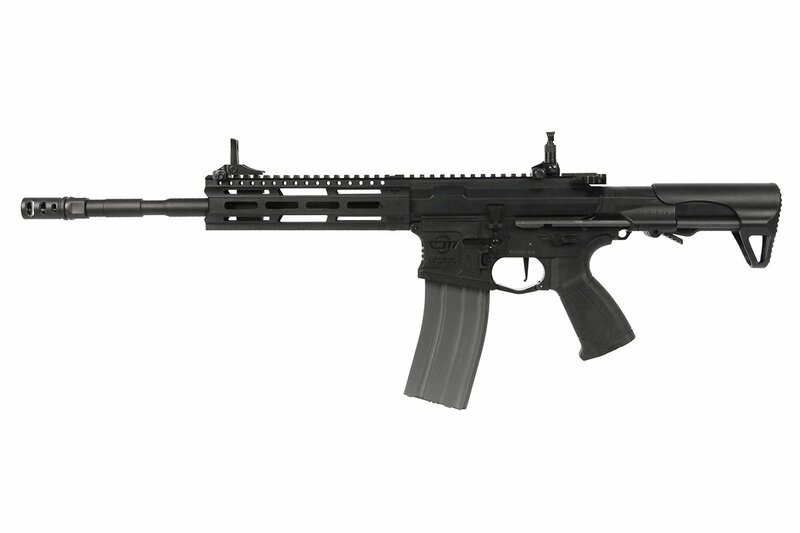 From what I've heard, it is considered "advanced beginner" level, but I'd recommend it to anyone looking for a solid AEG M4 at a reasonable price point. Overall, seems like a very solid gun. Can't really expect more for under $200.00! - Great build quality. Looks like the real deal (so don't go flashing it around in public dummy). - This model comes with the V2 gearbox, electronic trigger, mosfet, rotary-style hop-up, and a tighter bore barrel than the standard combat machine. Great bang for your buck, in my opinion. - With an 11.1v Lipo, this thing is very snappy and responsive. Good for quick follow-up shots. 3-round burst mode is functional and can be almost indistinguishable from semi (sounds like a shot and a half). - Dust cover pops open when you pull back the charging handle, which pulls the faux bolt back to reveal the rotary hop-up. A neat feature. 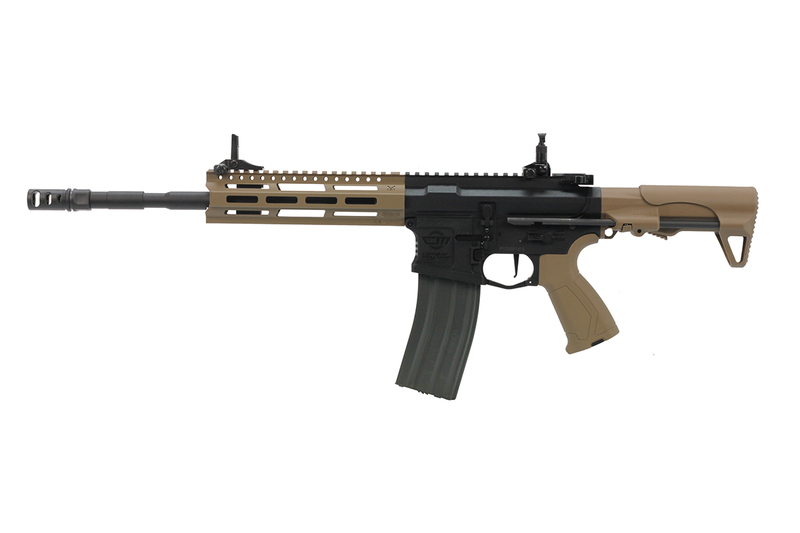 - This model comes with an MLOK compatible handguard. I think it looks really cool, so I went for it. Unfortunately, in my experience shopping around, I found that the options for MLOK accessories can be a bit more limited/pricey than standard picatinny counterparts. I knew this going in and it isn't a huge drawback, but consider before buying if you plan to deck your gun out with accessories. - Charging handle is a bit flimsy and does not lock back. The faux bolt catch is non-funtional. A nice touch for realism, but it is a bit flimsy itself and wobbles. It would be really neat if it would actually catch and hold the faux bolt until hop-up adjustment was done, and would let the faux bolt forward when pressed. That would be amazing. Then again, I would probably end up wasting time playing with it. - The buffer tube has a fair amount of wiring and whatnot going on with the mosfet and such. It took me a few tries rearranging things to fit an 11.1v Lipo in it, but it fits. I count this as a con, since I had to rearrange wires in the tube 4 times to make it fit. -The gun I received had a very very minor cosmetic flaw on the plastic where the body meets the buffer tube. It is just a scuff or something where the coloration is more white, but it is hardly noticeable. Can you cut the fps down? Using the hop up to 350?